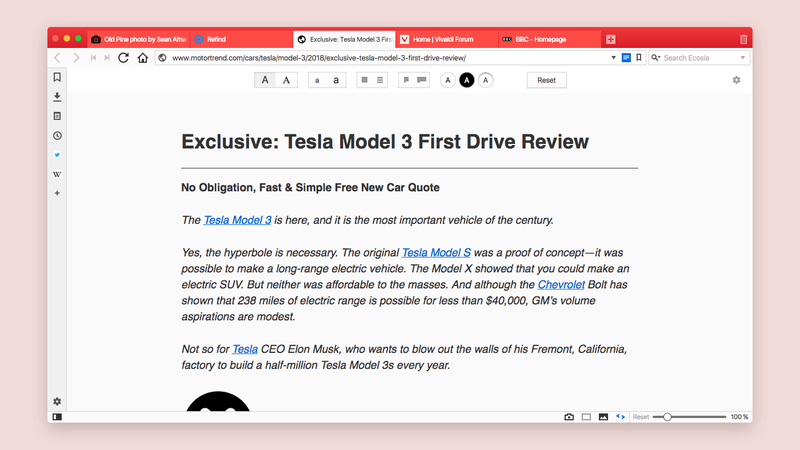 Vivaldi’s Reader View lets you cut through the noise as you browse. No ads, no pop-ups, just pure content. Go to Settings / Preferences > Webpages. Check Display Settings on Page in Reader Mode. The Reader View icon appears in the Address Bar for every webpage that supports this feature. Click on the icon to display the page in the Reader View. Once active, the icon will turn blue. Click on the Reader View Settings icon at the top right corner of a page to open the settings. Here, you can fine tune font type and text size, set column width and line height, as well as select either dark or light background. You can also choose your Custom Theme to set the colors for the Reader View. * To enable vertical reader mode, go to Settings > Webpages > Reader View and enable Allow Vertical Text Direction. If the Reader View icon doesn’t show in the Address Bar, the page may not support this feature. Reader View icon will only show when the webpage has suitable content. To exit the Reader View, simply click on the Reader View icon in the address bar.